6 years after my last back surgery I find myself having back surgery again. 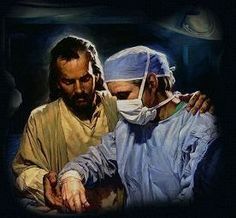 This will be my third Back surgery and I pray my last to repair my lower back. Because I have an abnormally narrow spinal cord my surgeon has to shore up the Lumbar area to take away the pinching of the nerves. As I prepare for surgery I have done a lot of reading and came across the story that took place in an operating room that deals with integrity and doing the right thing. In the operating room of a large hospital, a young nurse was completing her first full day of responsibilities. "You've only removed 11 sponges, doctor," she said to the surgeon. "We used 12." "I removed them all," the doctor declared. "We'll close the incision now." "No," the nurse objected. "We used 12 sponges." "I'll take full responsibility," the surgeon said grimly. "Suture!" "You can't do that!" blazed the nurse. "Think of the patient." The surgeon smiled, lifted his foot, and showed the nurse the 12th sponge. "You'll do," he said. Do you have the integrity do what’s right when pressured? Dear Lord, we pray that we would have the integrity to make the right decision. Help us to stand against what we know is wrong. In the Name of Jesus, Amen.